The Regatta Quay development on the Ipswich waterfront remains empty as a result of capital flight and inadequate investment and planning policy solutions. The result is a concrete skeleton looming over the town. The built environment is littered with the ruins of stalled development, from incomplete tower blocks to the concrete skeletons of luxury holiday villas. In the wake of the financial collapse of 2008, such ruins have only increased in their number and visibility, the product of “capital flight”, liquidity crises, and a systematic loss of confidence in private development and the residential market. After all, when the bubble burst, this empire did not disappear. It left traces of itself. The “Regatta Quay” of the British town of Ipswich, even if it was only ever a regional development, has not been spared this fate. Several years ago, in early 2011, I attended a packed London conference centre with developers from across social housing and commercial development. Early on in the proceedings, the convenor invited the room to indicate how many of those present were overseeing active developments, with “spades in the ground”. Tellingly, only a few of those hands rose. Perhaps a more interesting question would have been, “how many own a development that has stalled?” Because due to a variety of factors – not least the economic shifts that have occurred as a result of the banking crisis and subsequent recession – landscapes, from the Spanish coast to the centres of European cities, have been increasingly littered with stalled and vacant lots. An unfinished architecture which, in London, in 2012, accounted for some 170,000 homes, stalled, awaiting work to begin, or only half completed – building sites eerily void of activity. The hulking presence of an unrealised building project loudly underlines the way in which the built environment is first and foremost a projected environment. Projected, that is, by the guarantee of sales and attraction, of matching demand with supply. Where these projections proved illusory, ruins began to appear and they make for a striking lesson in the dependence of local development on wider flows of global finance capital. The “Regatta Quay” of the British town of Ipswich has not been spared this role. Ipswich Regatta Quay and the “Wine Rack”. Since 2007, the Ipswich docks have been a site for concerted efforts to “breathe life” into the quayside, and after that, the city. Building began on the so-called Regatta Quay in the same year, when the local council supported private investors and planners who intended to create a new centre of gravity for this now marginalised urban area. However, the financial collapse of 2008 put paid to this optimism, as the half-completed development was halted due to a lack of financial investment and its developer went into administration. 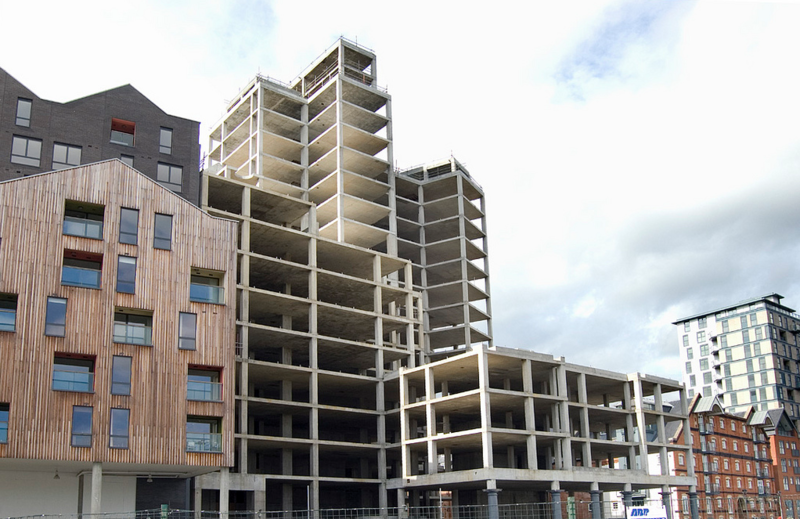 From 2009 onwards, the keystone of this development – Block A – remained little more than a concrete shell. It has become known locally as “The Wine Rack”. More recently, excited talk of an adjacent “enterprise island”, a host for businesses, technology centres, and retail units, has dominated discussion of the site’s future – in an attempt to “regenerate” a development that was only a few years ago an act of regeneration itself. But this talk remains “talk”, and promises by the Local Authority to reorient traffic flow to provide access to the marginal site, and provide funds for a “bridge” between the quayside and the “island”, remain dependent on a raft of planning permissions and sustained commercial interest which the local press has covered at best unenthusiastically. A similar fate has faced The Mill, a 23 story, mixed use development which formed part of the same waterfront site. 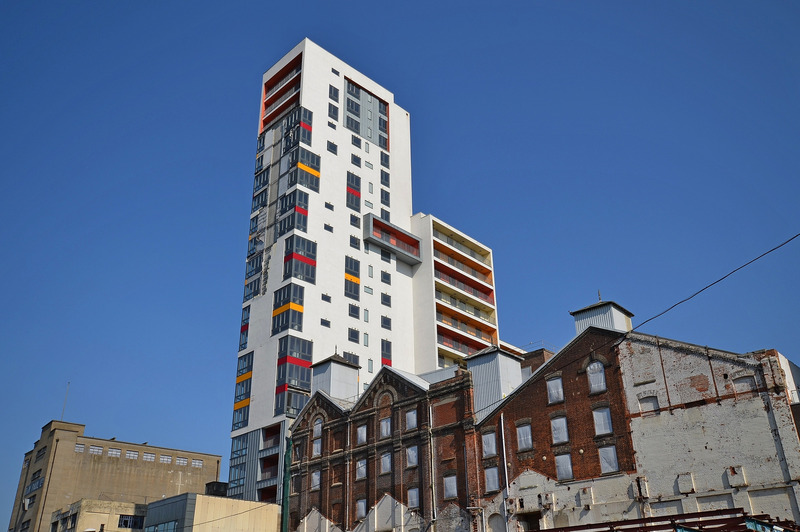 Costing £42 million, the building has extremely high levels of vacancy, large parts of it are yet to be fitted out and when some of the structure’s cladding came off during a storm, the integrity of the design was put into serious question. The site remains a symbol of the failure of local planners and institutions to reach a viable resolution for these typologies of abandoned, post-recessionary architecture. 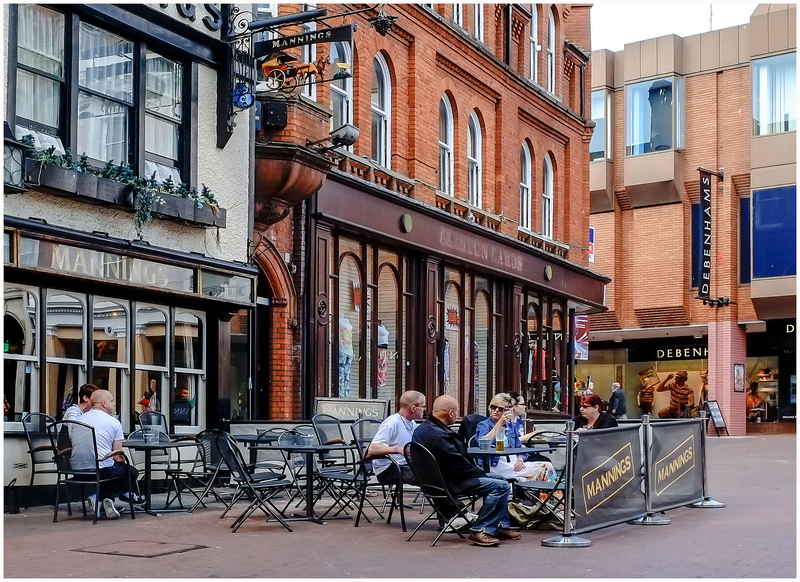 Ipswich has suffered the fate of many of the UK’s former industrial and fishing ports: its population has plateaued, it hosts few major employers and its town centre is largely depressed or constituted of the “usual suspects” of chain stores and budget shops. It is, in short, a “dead space”, a route to reach other places, other sites. The Quayside development was intended to change that, to create an elite imaginary of comfortably middle-class waterfront living. This at least matched some expectations; until 2008, living standards had risen, and this was buoyed up by significant and optimistic interest from development investors. Ipswich’s proximity to London as well as to Local Council offices, hospitals, and other institutions, made it a potentially ‘ripe’ location for investment. Yet Ipswich has not borne fruit, the putrid Wine Rack testifies to this fact. When I visited Ipswich to dig further into the physiology of this ruin, its presence is unmistakable – a visually dominant structure of exposed concrete which brands the entire waterfront development with the manifest signal of blight, a sight which readily explains the failure of The Mill to resolve its own vacancy problems. What is remarkable is not only the way in which the structure so sadly disfigures the waterfront, but the fact that the quayside itself, beneath the formation, is largely quiet – except for the masts of boats, knocking gently together on the water. The original optimism surrounding the development seems to have concealed the fact that the site is not the ‘natural’ centre of town, nor is it viably linked to it. Between the centre and the waterfront lie a system of choked ring roads and industrial and commercial units. Some traffic is generated by the university college, which can use the waterfront as a route to access the train station. But there is none of the patient curiosity or aimless idling which are typically associated with spaces such as these (consider, for instance, Bristol’s hugely popular harbourside redevelopment). Commercial units in the ‘base’ of the buildings have been partially filled by more chain restaurants, the tables notably absent even at lunchtime. Meanwhile, at the northern end of the site, the quay terminates abruptly in the noisy and traffic-snarled roundabout where several B-roads intersect. A structurally and materially interesting factory building sits at this terminus, though the certain attraction of its urban decay does not function to pique interest but rather to abut the entire project like a poisoned book-end. Interestingly, even on these unfinished or decaying buildings, you see very little of the ground-level graffiti associated with such spaces. It’s so out of the way, and so dislocated, that it even eludes these trusty prophets of transgressive place-making. The Ipswich Quayside and the shadow of its “Wine Rack” highlight the way in which pre-crash development and regeneration discourses were often poorly oriented to the reality of urban dynamics. The optimism of the site – a hub for high-end retail units and elite property speculation – has not matched the trajectory of the town, with its depressed local economy and poor connectivity between waterfront and town centre. Simply walking to the site entails a series of stops and starts, its location remaining almost hidden until you unexpectedly stumble across it. It does not have the gravitational pull to draw in shoppers from the town centre. Its restaurants are empty, and little is made of the port heritage which remains the site’s most obvious (and untapped) resource. Access, traffic flow, and other related urban design issues require attention in order to at least notionally change this situation. Yet the local authority, the organization responsible for this, has merely offered further public-private partnerships and investment options . These solutions are increasingly inadequate when faced with a market which is wary of the whole-scale regeneration which typified the pre-crash period. 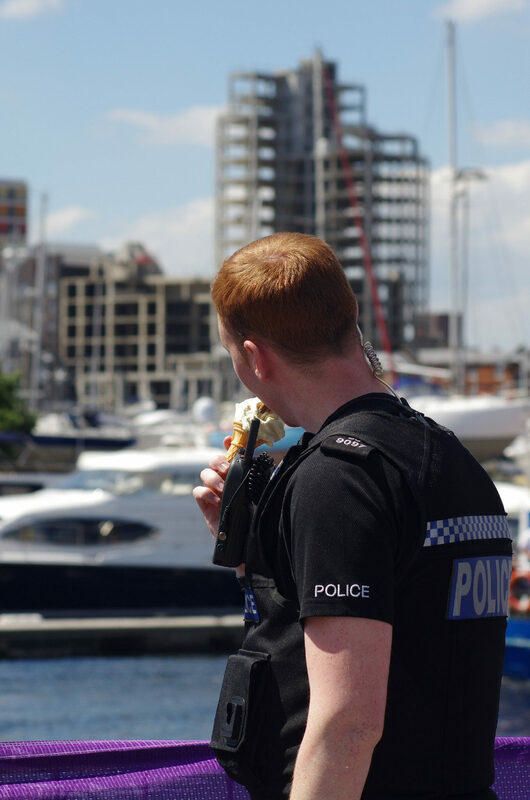 A police officer enjoying an ice cream and the view of the “Wine Rack”. But this also calls into question how we ‘define’ the ‘ruin’ at all. Is abandonment sufficient, or conscious destruction and destructability? Does the artefact – in this case, the Wine Rack – once departed from its original purpose, become then a ruin, in the way that a battlefield is a ruin, or an ancient city? Destruction of material did not create this landscape of financial collapse – rather, it was the effects of capital. If we begin to think of archaeologies of ‘ruination’ not as a kind of temporal analysis, but as one that that is concerned with the processes of construction and deconstruction, habitation and abandonment, then the sites of the 2008 financial crash – foreclosed homes, boarded-up businesses, and unfinished architecture – become themselves part of the archaeological record. In so doing, they allow us to ‘dig’ at them, and to interpret their formation and change, and thus to witness how ruination is not simply a destructive force (a directed energy intended to disperse), but also a product of indifference and the changing capabilities and interests of financial investment, of globalisation. What this says is that the previously optimistic and congruent relationship between the local government and developers (the pre-2008 optimism) has been replaced by a more guarded cynicism, even a distrust; a distrust made material in the ruination and abandonment of the pride of the waterfront’s development, the ‘Wine Rack’. Ultimately, you get the sense that Ipswich’s residents maintain a healthy disregard for the promises and attractions of the waterfront. While not “buzzing”, the original town centre is popular in the low-key way that many UK town centres are popular. Its modesty stands in sharp relief against the bold and unrealised optimism in development capital which the Quay once contained.There are at last hints that a new developer will oversee the completion of the project. But rather than relying on the slow gears of public process and capital investment to arrive what was required all along were modest and creative planning decisions. One of the major challenges now confronting developers, lease holders, and planners is how best to utilise sites such as the Ipswich waterfront now that some of the dust of banking crisis appears to be settling. All should learn how to conduct a variety of this now inverse archaeology – rebuilding sensitively, rather than excavating, thus reversing the trend of modern ruination. In doing so, they can begin confronting the scars of the built environment’s collapse.